The design of the new Optics Center of Excellence integrates IDEX Health & Science’s different optical technologies and its research and development capabilities that will enable IDEX Health & Science to create a world class optical coating facility, scale-up sub-system manufacturing, and expanded optical and sub-system design capabilities. 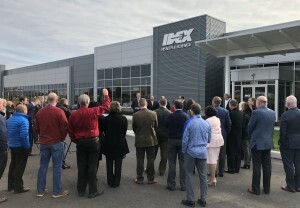 By combining these functions into one new facility under common management, IDEX Health & Science will be able to deliver on its commitment to its customers to be a best-in-class supplier of optical systems. Joe Rytell, President, IDEX Health & Science said, “We have focused on the growth of highly engineered optofluidic sub-systems and components across our target markets. This focus, coupled with our deep technical expertise, has driven accelerated growth in our optics business. The new investment in facility, equipment, and people will enable IDEX Health & Science to better serve our customers and execute on our exciting long term growth plans.” “Additionally, we have established a commercial, research, and development center for innovation in Carlsbad, CA, that will enable continued growth in illumination technology and optomechanical assemblies,” continued Rytell. IDEX Health & Science selected the Rochester area for its new facility due its rich optical technical base of people, universities and supporting businesses. Additionally, the concentration of current employees and business functions along with governmental support of optical businesses in Rochester contributed to the decision. “Rochester is the place to be,” said Michael Ransford, VP Operations, IDEX Health Sciences.